Learn more about some of the best adventure motorcycle boots, and discover why the Alpinestars Corozal Drystar Boots and Forma Adventure Off Road Motorcycle Boots took home our Editor’s Choice Awards. For me there has always been two pieces of gear that I absolutely cannot ride without. Helmet is one and boots are the other. Without the right pair of boots a simple get off or a stray rock can result in an emergency room visit. This is especially true with adventure bikes. Adventure bikes are generally 500+ pounds, regardless of the type of boot you are wearing a simple get off with that size of a bike laying on your foot is going to be uncomfortable. With a low cut street riding boot or worse, a hiking boot, this could be catastrophic. Adventure riding puts forth a unique set of problems when trying to pick the best boot. Adventure riding is heavily based on destination based travel. This usually means riding to a small town eatery, national site, festival etc. Once you arrive chances are you are going to need to walk around. 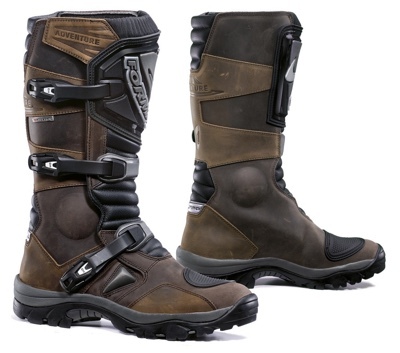 This is where the largest difference is between standard dirt bike boots and adventure boots. Dirt bike do not need to let the wearer walk around comfortably. They need to protect the ankle and foot at all costs. Adventure boots need to to protect as well as allow walking comfortably. Comfort: Whether you are looking for an adventure boot to commute to work or go on a multi week cross country adventure, you are going to need to be comfortable. If a rider is focusing on anything other than riding they are more prone to mistakes. If you are standing primarily certain pegs types can fatigue the foot quickly if the sole of your chosen boot is not stiff enough. If you are constantly riding in weather a waterproof boot may be ideal for comfort. These are all things to consider when choosing the most comfortable adventure riding boot. Durability: This is typically a non issue for most midrange and high end adventure and dual sport style boots. Most of them have fully stiched or bonded soles that are heavily resistant to wear. Be aware if going with cheaper boots (i.e. less than $200) you may run into durability issues. Protection: The whole point as to why we wear riding boots. If you want full on, the best protection you can get than a true dirt bike boot is the best way to go. As established earlier, that simply won’t work for most adventure riders because there is too much walking needed once we arrive at our destination. So really we are faced with a balancing act of how much protection we want and how much “walkability” we want as well. Most of the boots we reviewed walk this line very carefully and deliver on both fronts. Value: This is one of the few adventure gear categories that spending yourself into oblivion doesn’t necessarily give you a better product. If you are willing to go over the $200 threshold, you will be able to maximize your dollar. 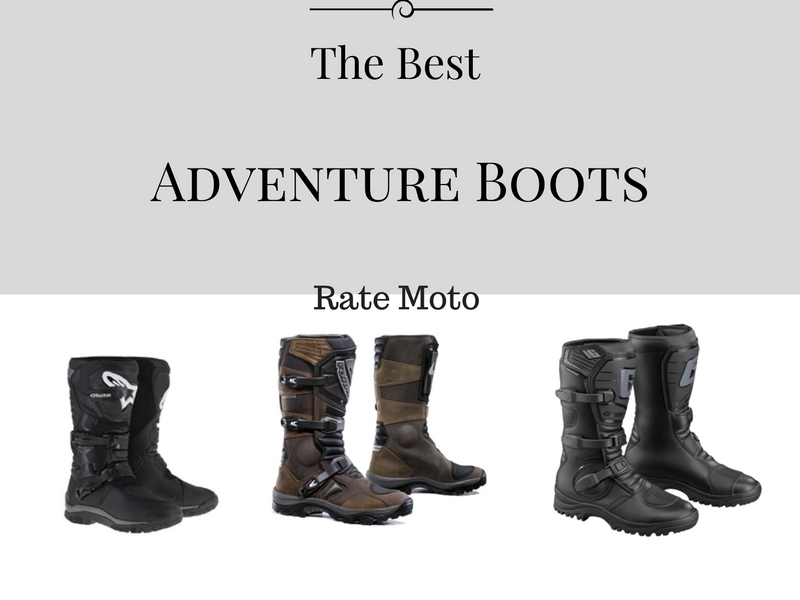 Every boot reviewed here has proven to be a great value in adventure riding boots. 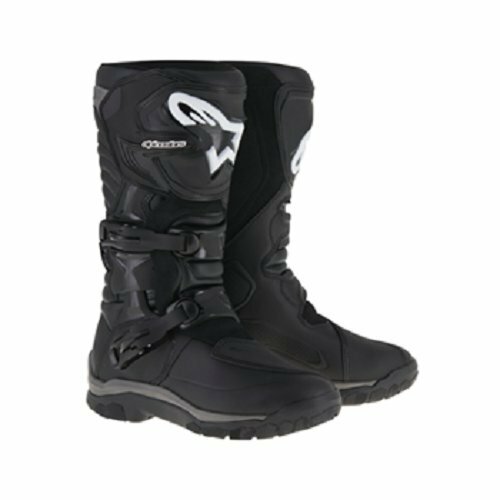 The first thing you’ll notice if you check out these Alpinestars Corozal Drystar Boots on Amazon is that the reviews are not good. Let me save you some reading time. Every complaint with this boot is that when you are walking it makes a clicking sound. This is true and luckily it has an easy remedy. Spray the buckle with WD40. For reasons I don’t know the boot shipped without the buckle being properly lubricated. If you can get past the fixable click on the buckle, this is one of the best adventure boots you can buy. Coming in well under $300 at the time of writing, this waterproof boot is everything an adventure boot should be. The boot comes up to the upper shin like a traditional motocross boot would which gives you increased protection in case of a get-off. It also is just flexible enough to allow a normal amount of walking once a rider gets to his or her destination. Overall this is a fantastic boot. Easy to put on and take off, decent waterproofing, superior protection and most importantly, one of the most breathable waterproof boots you can buy. I’ll admit it, I’m not much for vanity but these Forma Adventure boots are absolutely stunning in person. The brown (they also come in black) leather upper on these boots absolutely make them stand out from other adventure boots. Obviously looks alone did not get the Forma into our best adventure boots list. The Forma may just be one of the best hot weather full protection adventure boots. It’s breathability combined with the level of protection that a upper shin boot offers means its a top pick for us Arizona riders. In order to be totally breathable in even extreme conditions, certain concessions must be made. While the Forma’s materials are in fact waterproof, that doesn’t necessarily mean that it will be able to keep your feet dry in a down pour. If you suspect lots of moisture on your ride I suggest you pick up a pair of motorcycle boot rain covers to keep in your bag. Overall, if maximum protection, comfort and breathability is your priority, the Forma would suit you perfectly. The Gaerne G Adventure Boots are a no nonsense waterproof adventure boot. With a full grain upper and molded sole, these Italian made boots are a great value for a rugged, waterproof adventure boot. The Gaerne G is going to shine in wet and cold conditions. This boot offers up superior wetness protection to others on this list but is going to be a bit less breathable. If being used in the conditions it’s meant for, the Gaerne will absolutely outshine many boots twice it’s price. When considering the craftsmanship, quality of materials and its extreme waterproofing, the Gaerne is tough to beat for a late season cold weather boot. 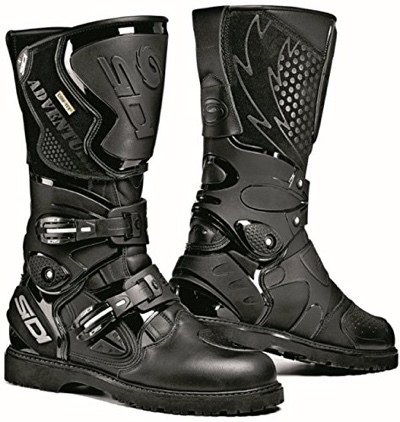 The Sidi Adventure Motorcycle Boots are a hybrid of new age motorcross boots and old school dual sport design. The Side Adventure series sports an upper very similar to their moto boots but with only 2 buckles they are very easy to put on and remove. The sole is a very traditional “boot” style sole which gives the user a familiar walking platform. 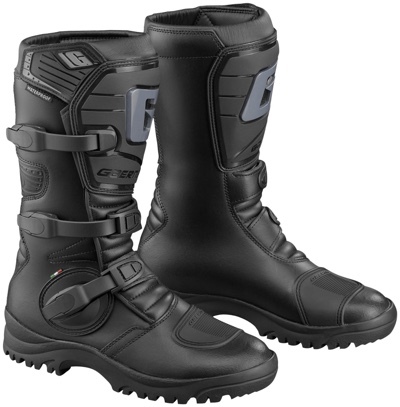 When a boot uses an upper similar to a motorcross boot you typically have the limitations in movement that are apparent in most boots of that style. Not so with the Sidi. Sidi integrated a neat hinge system right at the ankle to help get some additional movement for walking all the while keeping as much support as possible. The Sidi Adventure, like most Sidi boots, is a premium Adventure style boot that comes with a premium pricetag. Anyone who has had the pleasure of owning a Sidi product knows that they are top notch.